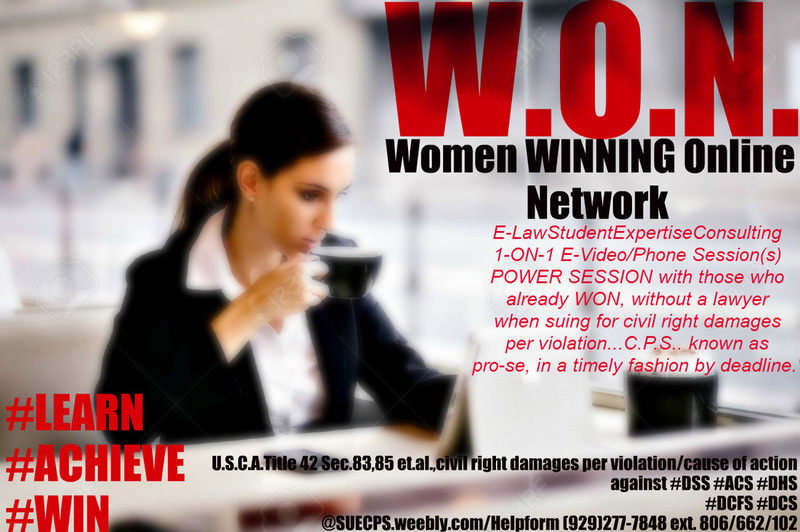 Powerful-Online 1-on-1 Network​-" when suing cps worker by deadline." If our founder,owner has successfully done so,you can too." Hours of Operation: 10:45 a.m.eastern-8:45 p.m.
Since,our W.O.N.network,virtual online powerful network are not lawyers,you should continue on searching for lawyers,and never give up,when doing so. If you are suing,as our founder"successfully has file pro-se self file, we wish you the best of luck." Ask for extension 102 after implementing the HELP FORM/CONTACT us form. Parents have a constitutionally-protected right to raise their children. Do not wait until deadline forever bar you from holding abhorrent dyfs accountable everyone. THIS IS HOW SHE WAS RAISED. BY FIGHTING FOR WHAT IS RIGHT. She began to prepare,put into motion the prerequisite,to ensure she is one day able to procure law degree after implementation of law school,and meanwhile remain a FORCE front and center for ALL truly violated by new jersey dcpp,when lawyers are not being truthful with such party violated by cps,for those suing in a timely manner CPS worker rightfully so for such inequities,consisent with the inactions/actions/by such worker who"assume"he or she will be able to get away with the torture of YOUR child/grandchild/family and your own violations,caused by such worker.ext. 102.
for which no jury shall disagree in our 3rd district. .Lawyers,Experts coast-to-coast,throughout NJ call-in,to support her daughter,and her publicize lawsuit. We appreciate,entire staff,such overwhelming support,ergo when your suing pro-se self file everyone the work is extensive,and time consuming,however, your beginning FINALLY to take back your right when you are doing so,and your NOT going to let DYFS get away with the extreme-and continual harm,violation that has darken your life,for far too long. Wrongful Removal after DYFS furtively withheld evidence and or altered evidence,medical to a police report(s)and or lied under oath to simply make it appear child was at such risk. Has NJ DYFS,DCPP,DCF,caseworker,supervisor illegally and unconstitutionally-executed their warrant of an "emergent" removal premise on "Imminent Risk to child life?" Continued-Detention of one's child,being sexually abused right under the supervision of dyfs, yet your being DEPRIVE such constitutional right to bring child home where child clearly will be protected,NOT abused sexually,seriously injured,nor at any staid risk of harm.Begin on your suit and feel good while learning pro-se. Has New Jersey,Burlington, SALEM, Cumberland,Somerset, PASSAIC, PATERSON, WARREN, Union,Essex County Caseworker,DYFS-CPS worker infringe on your constitutional right to such privacy by disseminating to other parties,without your knowledge;to those no privy of such? Limited time to file your lawsuit on time,when your seeking civil right/injury/monetary/damages et;al,against abhorrent DCPP,DCF,DYFS,CPS. Child removed during a "court-ordered visit with the non-custodial parent and not returned,while DYFS conjure up false evidence against you? As a result, you're force to live day in day out, without the most beautiful happiest part of your day? EXT. 806 (Specifically speak to owner/founder Ms.S.Melendez on this part, as she personally sued on such factual et.al, and did win such relevant decision when suing, as news report validate to see her family damages suit against DYFS,DCPP move forward while she was acting pro-se. Such relevant decision was APPROVED by the U.S.District Federal Court,while acting as a pro-se litigant,when such relevant huge decision, against DCPP,DCF, DYFS caseworker(s) were attempting to have her family suit dismissed." Didn't happen with this family clearly harmed/clearly injured, shocking the conscience of all who have validated such abhorrent mis-treatment,by employees @ CPS who knowingly violated a constitutional right,of per daughter/loving doting suburban parent,who, for almost a decade NEVER gave up, when her constitutional/civil rights were violated." Experts agree worldwide,"no reasonable jury shall ever understand why the employee(s)on her suit,now winning, did what they did,when it was so easy to adhere to law and not keep the girls,but reunite the loving suburban happy family. Be sure to inquire when you're having your POWERFUL free session today. "(read more below prior to calling our very busy EFFECTIVE network, thank you.) 1-929-277-7848. HAS DCP&P,DYFS,DCF lied by making you "think" you had to sign a document allowing your own children to be taken away, without evidence of serious injuries/abuse/neglect? No fact finding hearing/trial,after your losing such right to custody? No Dispositional Hearing?As a result your child was kept out of your home,approve by superior court,and DYFS? No permanency hearing,under Title 9;and or Title 30 action,by DYFS,and or the family superior court in NJ? Grandparent being deprive the right,legal right to see child;visitation is non-existent? Grandparent inform your not able to have custody,but yet DYFS allow child to remain in harm's way? Termination of Parental Right hearing consistent throughout with untruths,therapist lied on your family,to make you deemed as "unfit?" now terminated-file your suit pro-se do not wait until DEADLINE to do so. immediately look at how much your"lawyer has NOT done." Compare it to what your now learning then immediately take ACTION,to put on notice of intent to sue caseworker at once,then get started on your lawsuit, for money damages per civil right violation-involving wrongdoing to your child and or grandchild involving child protection services,in New Jersey before your time shall run-out soon enough to sue when #dcpp #dcf #dyfs #cps has violated your right to nurture,RAISE per child,grandchild, to keep your family under 1 roof, in tact, together, healthy,sane and happy... Most did not even know they are able to place worker on (required)notice of one's intent to sue, til' reading the HORROR and the truthful hard fight of owner/founder S.MELENDEZ, who now has focus on her goal of achieving the level,of the implementation in due course of law school,after media validate her winning such huge right to her $50MILLION DOLLAR civil rights suit,for her/her girls in suburban jersey,that one the right to move forward and she did so everyone,as media news validate,without a lawyer. Such hard work,by her,and her reasonable logic-applied and critical thinking skills,and her passion for JUSTICE after the GRUESOME horror to her once sane happy girls,for almost a decade,was her way to demonstrate EFFECTIVELY astutely, to the U.S.DISTRICT FEDERAL COURT,even as a pro-se litigant that she is entitle to damages,as her beautiful daughters,all unlawfully/wrongfully/continually kept apart when shockingly a caseworker KNEW (Actually several )there was no abuse substantiated/no neglect, NOTHING. 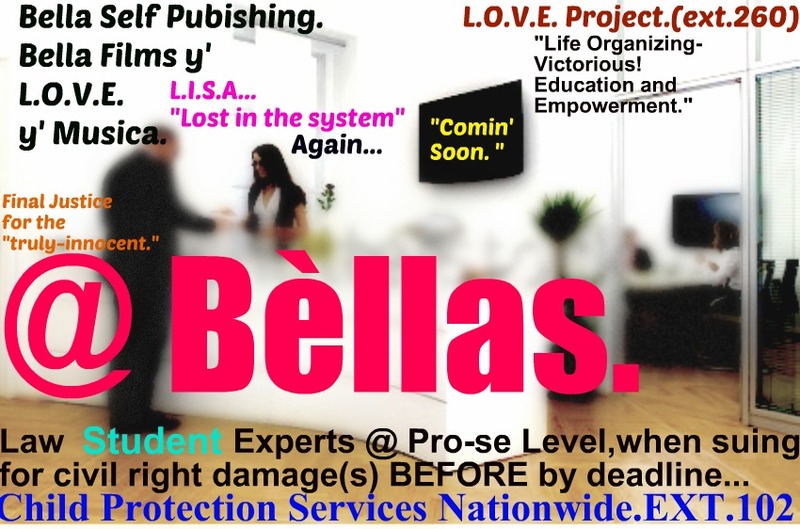 (the tragic events that follow continue to SHOCK THE CONSCIENCE of all reasonable minds in her state, and the nation.She filed her suit and followed through with her constitutional,civil rights injury family lawsuit pro-se(self file)correctly,accuracy throughout,the right way. DEADLINE, however to file timely do exist." in 15 min., to 1 hr, then call in(after you are confirming you're to call in,when receiving such approved email for your 1-on-1 POWER SESSION On suing by deadline, pro-se cps.